Supercilious literally means "eyebrow" in Latin. Because when people (apparently even ancient Latin people) are haughty, they raise their eyebrows in disdain. 1529, from L. superciliosus "haughty, arrogant," from supercilium "haughty demeanor, pride," lit. "eyebrow" (via notion of raising the eyebrow to express haughtiness), from super "above" (see super-) + cilium "eyelid," related to celare "to cover, hide," from PIE base *kel- "to conceal" (see cell). I did two things on my way home from work yesterday. First, you must understand that we have been suffering through a cold snap the past month - a below zero, skyrocketing heating bill, windchill sort of cold snap. I think that it's on its way to being the coldest March in Anchorage - ever. Anyway, this past week has been much much better - it's warmed up to above zero and yesterday I think it was even in the twenties. So, of course, I jump the gun. "How cold can it be?" I ask myself in my well-heated room after a long shower. "Surely not cold enough to wear my winter jacket!" It was cold enough, and don't call me Shirley. So the first thing I did on my way home from work is freeze. I was wearing my blue wool zip up hoodie (If you've seen me twice, you've probably seen me wear it), hunched like Quasimoto over my steering wheel, hating life. The second thing I did on my way home is stop for dinner. Due to the crunch of the tax season (and my inability to get out of the house before eight a.m.) I've been working pretty late - seven or seven-thirty (eight, if I decide to blog). When I finally head home I am so starving that my dinner usually consists of a bag of Doritos and as many Oreos as my hand can span (a girl's got to have limits). "Not tonight!" I thought last night, determined to break the forming habit of a snack-food meal, and I resolutely pulled into a restaurant parking lot. A little place called McDonald's. Perhaps you've heard of it. What has happened to our relationship, McDonald's? It used to be so carefree and happy. My eyes would light up with joy when they spotted the Golden Arches. I used to beg my mother, my father, anyone who would lend an ear - "Take me to Mickee Dee's!" Chicken nuggets shaped like big feet and hot air ballons would float through my dreams. I loved you, and I didn't care who knew it. But we've grown apart, McDonald's. We never talk anymore. We never laugh. Somewhere between college and Supersize Me, I've grown embarrassed that I like you so much. And now even when I do stop by it is with a guilty conscious and a supercilious air. "If sikegami were dead," I say to myself, "she would be rolling over in her grave!" I hide my trash. But who am I kidding? I'm no gourmet. And I do love chicken mcnuggets. Are they going to google me? So I think that I'm going to be an adjunct professor. After toiling for years at the slavish whim of a 10-key calculator, I now have the opportunity to straighten my back and impart my wisdom into the brains of a whole new generation of accountants. I am a leetle nervous that my students are going to google me and find this blog. Yikes. I'll lose all credibility. Maybe I should teach under a psuedonym. Those would all be pretty believable. The class doesn't start until late June, so I have plenty of time to procrastinate. ...and the tears are in my eyes. 1. Look away, baby, look away. 2. Offer me a tissue. Sorry. Only time for a short list tonight. I just spent and hour and a half playing Dr. Mario. By myself. Why did I ever let that game back into my home? Nobody does it like her. I was standing in my kitchen this evening, enjoying a slice of Sara Lee's Whipped Cheesecake (with strawberry topping and graham cracker crust) when my eyes happened to fall on the familiar slogan emblazoned across the empty box. Wait a second, I thought. What does that say? No, really, what does that say? The famous, well-known slogan is "Nobody does it like Sara Lee!" Right? Apparently the phrase is (and has always been) "Nobody doesn't like Sara Lee." How could I have lived my whole life without knowing this? What if movies were marketed on their character actors? The underworld is no place for a lady, but for one woman, it’s the only place that feels like home. In a world where no one can be trusted and the line between good and evil is negotiable, she must fight to maintain her dignity, her poise, and her position as the head of the British Secret Intelligence Service. In a land where a prince’s word can shatter all security, one man struggles to survive. Cursed by his very skin, he lives a life of suppliant slavery in the bowels of a torture chamber, his spirit torn between cheer and hopelessness. He has resigned himself to spending the rest of his days feeding and cleaning the broken, until one day he meets a stranger who has something that not even the prince can break. And he knows that life in the kingdom will never be the same. George Pappas had it all. A date every Friday night, a rent-controlled apartment, and a fulfilling job at a local New York City bookstore. But when his employer decided to take on corporate America, George found himself embroiled in a battle he did not choose to wage. Now he must decide whether he will fight for what he loves, or go to the Nut Shop, where it’s fun. 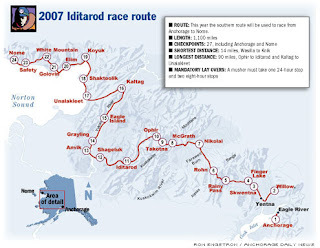 The Iditarod is a 1,100 mile dogsled race. The race takes days or weeks depending on how fast you are. There are mandatory rest stops and volunteer vets. 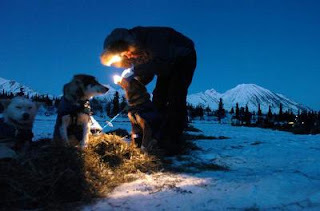 There are famous mushers, who have won or placed repeatedly - Jeff King, Martin Buser, Doug Swingley, DeeDee Jonrowe. There are rookies who are just out to finish with all their dogs. I'm keeping my eye on this race. I was cheering for DeeDee - who has placed repeatedly but never won - but she was injured at Rainy Pass and had to scratch. Boo. Now I'm cheering for Lance Mackey. He's never won either, but I think his time may have come. 82 teams. 1,312 sled dogs. 1,100 miles. Crazy. Please direct your attention to the Blogs of Yesteryear. I actually double checked my calendar to make sure that we were in 2007. There are a lot of reasons why I like the movie. It's English. It's smart. And it's just edgy enough to satisfy the rebellious nature of this Christian conservative. Julie Walters and Helen Mirren are both brilliant. That's why I like the movie. But the reason that I love the movie has nothing to do with nakedness or the actual plot at all. Do you remember that one scene when Jay Leno flies the Calendar Girls to L.A.? It's obvious that international first class is not exactly standard fare for these women, as they squeal and gawk at the posh in-flight accommodations. They throw decorum to the wind as they play with their seats and order wine. They use every item in their goodie bags - including the eye masks and the little sock booties. Most of all they enjoy it because they are together - a crazy experience shared with dear friends. It's a very short scene, but with me it resonated. When I was a junior in college, my Aunt Lucy took me on an amazing trip - a safari to Tanzania. And she didn't take just me, she took all my Mothers. That's right, Jessi and her five Mothers traveled across the African bush taking only pictures and leaving only LandRover tracks. My five Mothers consist of my mother (she gets in by default), my Aunt Lucy, Mrs. Harding, Linda, and Lorraine. These women have been part of my life forever. When my mom threw her back out, Mrs. Harding flew in to take care of us. When we moved to Anchorage we lived in Lorraine's two bedroom house for four months - and the Gates family is small neither in number nor proportion. Linda used to come up every year from her home in Boston to watch the Iditarod, laden with live lobsters and Red Sox paraphernalia. Finally she gave up and just moved up here. Aunt Lucy sends me and my mother books by the boxful - just the good ones. And then there's Mom, who is smart and hilarious and becoming more like me every day. 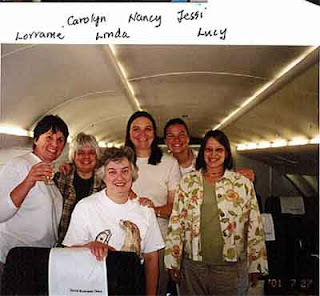 So picture Jessi and her five Mothers traveling to Tanzania - International First Class. Actually, you don't have to picture it. I think they caught it on film for this movie called Calendar Girls. Mom and I first watched this movie in the summer of 2004, just about a week after Lorraine passed away very suddenly. We were still shocky and griefy and a mess and the airplane scene struck us both the same way. True and funny and sad. We looked at each other and smiled upsidedown smiles. I want to write more about Lorraine - how she would steal me away before I was old enough to go to school and take me to high tea. How she dyed her hair "bodacious burgundy." How she made the best mint brownies, popcorn and hot chocolate. Ever. But this post is getting long. And rambling. My point is that International First Class is best when taken with a healthy dose of menopause.